‘Sector coupling’ has become one of the most well-known terms to describe the transformation of energy markets. It had originally been created for models that use surplus renewables, such as wind and solar electricity, to provide heat and power new means of transport. International organisations – for example, REN21 and IEA – have since established more general definitions and charts to illustrate the process. The figure on the left-hand side is taken from a presentation given by Paolo Frankl, Head of the IEA’s Renewable Energy Division, at the Mexirec Conference in Mexico last September. The chart shows the technologies needed for cross-sectoral integration: district heating, heat pumps and electric vehicle chargers. They are likewise mentioned in the Challenges of Energy Systems Integration chapter of REN 21’s Renewables 2018. Global Status Report, also known as GSR 2018. The authors of the report state that the technologies for sector coupling already exist. As an example, they point to heat pumps, which they regard as a mature technology that makes for effective penetration of thermal markets. They are also convinced that “district heating and cooling systems offer a ready pathway to use renewable thermal energy (such as solar, geothermal and biomass), as well as renewable electricity, as a substitute for fossil fuel sources” to facilitate the aggregation of multiple consumer needs in a way that is more flexible and economical than if systems had been installed in individual flats or buildings. The complexity of the approach becomes clearer when looking at cross-sectoral policies. This year, the authors of the GSR 2018 have expanded the Policy Landscape chapter to describe showcase examples, even though their number is still small (see p. 62 at download link below). One of these examples is Austria, where buyers of electric vehicles will receive an incentive for using only renewable electricity to charge their cars. 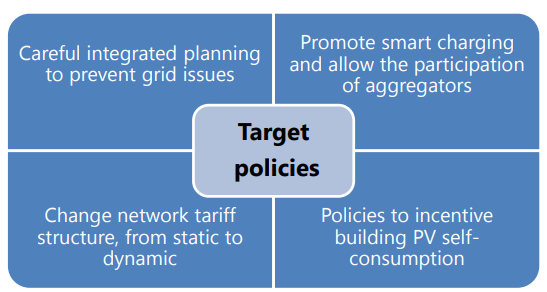 China´s policy environment is mentioned to introduce a monitoring system for solar power to steer solar PV investment towards regions with lower rates of energy curtailment. This is achieved by means of a clean energy quota, with targets set at provincial level. The National Energy Administration in China encourages energy producers to trade with heating companies, with the intent to gradually eliminate coal-fired industrial boilers and transition fuel sources for residential heating to natural gas or electricity. The small number of examples show that the implementation of sector coupling is still at an early stage and focused on the electric power sector. Policies to help implement sector coupling with a focus on the electric power sector, as presented by Paolo Frankl at Mexirec. It is thought to be vital that solar heating and cooling institutes and research networks get involved in the energy debate to give a voice to the heating sector. Austrian-based AEE INTEC is concentrating on one important aspect, namely the increased the use of heat pumps in residential space heating as one of the sector coupling technologies. However, electric heaters would not have that much of an impact on the market, said Werner Weiss, Managing Director of AEE INTEC. At the SHC conference in Abu Dhabi last November, he pointed out that heat demand showed 6 times the seasonal fluctuation of electricity consumption (see the chart below). 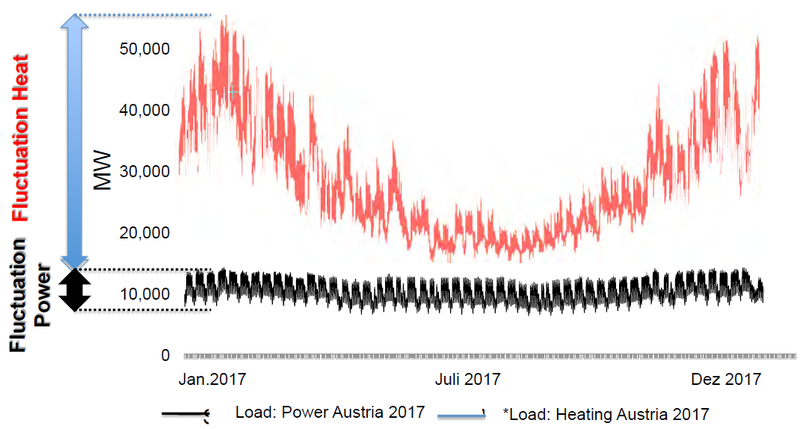 An increase in the electric load for space heating in winter would require expensive capacity additions. The authors of the GSR 2018 write about the importance of not putting more pressure on the electric grid when creating pathways for renewable electricity to new end-use markets.